Rolling Stone’s “500 Greatest Albums of All Time” list polarizes music-heads everywhere. While some newer artists hold high spots on the list, they are far and few between. Still, there is one curious anomaly: a single neo-psychedelia album on the list. That album is “Oracular Spectacular,” the 2007 debut studio effort by MGMT, ranked #494 on the list. The Connecticut band, which had little prior exposure, was instantly recognized for its greatness by the world’s most popular music publication. The album’s breakout single “Kids” has more than 200 million plays on Spotify and earned a Grammy nomination. Has MGMT’s new album “Little Dark Age” preserved this storied reputation? Not exactly. In 2017, MGMT showed fans there would be some experimenting on “Little Dark Age.” The band released the title single in October. The song was a fresh new sound and nothing like “Oracular Spectacular.” It makes sense — it’s been more than 10 years since the debut’s release and the band has experimented using other members. Since then, the original duo of Ben Goldwasser and Andrew VanWyngarden has stayed intact, but their sound hasn’t. Instead of resurrecting its earlier musical characteristics, MGMT went all the way back to the late ‘80s/early ‘90s age of synth-pop on many of the tracks con “Little Dark Age.” This approach is justified, though. Synthpop legends Kraftwerk won their first non-honorary Grammy for its 2017 live album “3D: The Catalogue” this year. Additionally, Depeche Mode was one of 19 nominees for the Rock & Roll Hall of Fame in late 2017. MGMT may be onto something. The word “calm” does not properly describe the lyrics, though. On “When You Die,” the vocalists sing “Go f— yourself” and “Baby I’m ready to blow my brains out.” Coupled with the music video, which portrays the bizarre death of a failing musician, “When You Die” is an undeniably captivating albeit graphic track. The problem is when this synth-pop style crosses into “creative borrowing” territory. The track “Me and Michael,” for instance, could be classified as a “tribute” to George Michael, though it sounds more like a carbon copy of the late artist’s “Last Christmas.” The chord progressions are different, but it’s as if the band used the same exact instruments as the ones that made “Last Christmas.” The two songs are painfully similar. Considering the fact that Radiohead’s lawyers might have sued Lana Del Rey for allegedly ripping off the English band’s song “Creep,” MGMT should lawyer themselves up. There is a myriad of influences on the album. Its opener “She Works Out Too Much” sounds like a rejected song from Thundercat’s 2017 album “Drunk.” The song “TSLAMP” resembles the Flaming Lips’ music but with a Daft Punk vocoder. “One Thing Left To Try” feels like the band fused the saccharine synths of Foster The People with the dance-punk vibrations of Talking Heads. The issue is that the psychedelic side of the record is hardly there. The instrumentation is soaked with reverb and other basic psychedelic musical techniques, but the music is to formulaic. 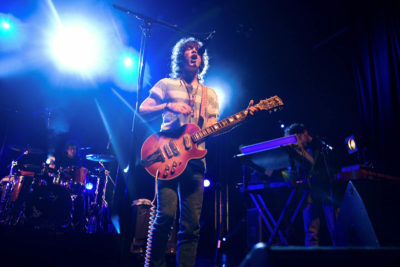 MGMT’s neo-psychedelia contemporaries have exhibited much more experimentation. Animal Collective’s “In The Flowers” goes from a simple descending arpeggiator to an explosion of drums and light vocals. Panda Bear’s “Bros” is a 12-minute tour-de-force that uses eclectic vocal samples and a gradual drum crescendo. Boredoms’ “(circle)” features furious drum patterns with shoegaze-esque guitars. On “Little Dark Age,” there are no off-kilter drums. No provocative vocal stints. Instead, there are occasional transitions between synthetic and acoustic sounds. It creates variation, but at the same time, predictability. The sum of these parts is an enjoyable MGMT album. Think of it as a gateway to the wonkier side of neo-psychedelia. Listeners less familiar with the genre will enjoy the synth-pop influences and MGMT fans will appreciate the band’s growth. Rolling Stone will not be adding this to its “Greatest 500 Albums” list any time soon, but the record is still a solid effort.